The Noyes Family of FOCIS integrated fiber inspection solutions provide network personnel with the capability to document fiber connector cleanliness. 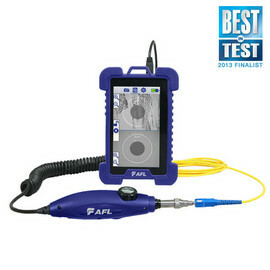 FOCIS combines a palm-sized DFD1 Touchscreen Tablet, a DFS1 Digital FiberScope and AFL SimpleView Plus inspection software to provide the inspection and analysis power of current laptop and probe solutions and the ergonomics, ease of use, ruggedness and ownership costs of basic "live only" viewers. FOCIS solutions are future-proof because their optical resolution and detection specifications exceed current international standards and their software-based inspection and analysis applications can be upgraded as market requirements evolve. The DFD1 Touchscreen Tablet is a purpose-built, hand-held Windows® computer equipped with AFL SimpleView Plus inspection software. Its bright crisp display provides detailed images and its Zoom/Pan feature allows users to identify the smallest particles, scratches or imperfections. Its portrait orientation makes it easy to hold and operate with just one hand. Unique to FOCIS is a patent-pending feature which simplifies before/after, jumper/bulkhead, input/output and other common fiber cleanliness comparisons. Additional features include image capture and store/recall. Up to 1000 fiber images may be stored in on-board memory and images may be transferred via any off-the-shelf USB memory stick or SD flash card. The DFD1 incorporates a proven shock-absorbing rubber boot that doubles as a tilt stand and hanger. The DFS1 Digital FiberScope is a high-resolution video inspection probe. It is equipped with a focusing knob and an image capture button. An extensive assortment of DFS1 adapter tips allows it to be used with all types of fiber connector ferrules and bulkhead connectors. Bulkhead tips are available in multiple lenghts as well as straight or 60º angle configurations. Connector adapters are available for PC/UPC, APC polished ferrule in 1.25 mm, 2.5 mm as well as MTP/MPO connectors. NOYES FOCIS solutions are packaged in a protective hard carry case that keeps all vital inspection and cleaning tools close at hand and ready to go to work.